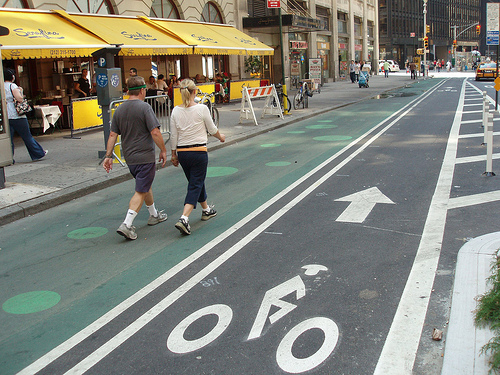 New York City residents speak out on their city's bike lanes, such as the separated bike paths pictured above. Photo via Spencer Thomas. Average carbon dioxide (CO2) emissions of new U.K. cars fell by 3.5 percent to 144.2 grams per kilometer (equivalent to 50 miles per gallon) in 2010, according to the Society of Motor Manufacturers and Traders’ (SMMT) tenth annual CO2 report. Though this number is less than the reduction of 5.4 percent achieved between 2008 and 2009, it stands as one of the highest reductions on record. Since 2000, the average CO2 emissions of new U.K. cars has fallen by more than 20 percent, making the percent of cars with CO2 emissions of 130 grams per kilometer and lower to increase from 1 percent of the 2000 market share to 40 percent in 2010. “New technology has delivered impressive reductions in CO2 emissions but coordinated action, to support research and development, new infrastructure and consumer incentives, is critical to securing significant future advances,” SMMT’s Chief Executive Paul Everitt said at the report launch. The study examined the distribution of political affiliations across respondents and found that 59 percent of Republicans believe that bike lanes are bad, 59 percent of Democrats believe that bike lanes are good, and 56 percent of Independents believe that bike lanes are good. Additional information from the public opinion poll, including New Yorkers’ thoughts on the possibility of Wal-Marts opening in the city, can be found on the Quinnipiac website. The Center for Transit-Oriented Development recently released a report examining the real estate development patterns along three new light rail lines: Hiawatha Line in Minneapolis-St. Paul Region in Minnesota, Southeast Corridor in the Denver region in Colorado, and Blue Line in the Charlotte region in North Carolina. The report is intended to help local planners and others make wise transit decisions that maximize transit investments and encourage transit-oriented development. Findings indicate that existing employment centers and downtowns, which include urban amenities, shopping and entertainment, are crucial to strong development along transit lines.